There were several notable female singers who performed and recorded in the Grand Rapids area during the 1960s. [See footnote at the bottom of this article.] 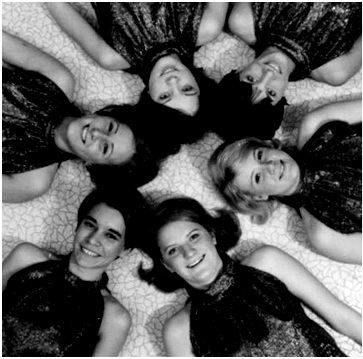 However, it was not until 1967 that our local music scene enjoyed the novelty of an all-girl rock band. However, other all-girl rock bands were performing in various parts of the United States. Among the earliest to obtain a recording contract were Goldie and the Gingerbreads. 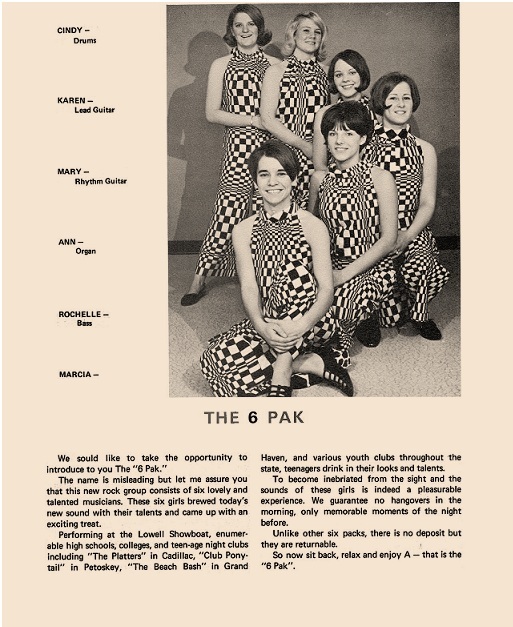 The 6 Pak visited ‘The Place’ on Plymouth N.E., in Grand Rapids, to meet with another fellow all-female Michigan band called The Pleasure Seekers. This group included Suzi Quatro, who a decade later provided the role of ‘Leather Tuscadero’ for the Happy Days TV show. Keyboard player Andrea Halas Sullivan began playing the piano when she was in third grade. She also knew how to play the accordion. Andrea invited her good friend, Mary (Arbanas) to join the 6 Pak. Mary’s father served as her primary musical influence, as he played the tamburitza, a Croatian instrument which resembles a mandolin. Mary recalls, “though we practiced almost every night, it was never a chore. It was not like that. We were like sisters. We had so much fun! There was no real competition, even though our singer, Marcia, and the bass player, Rochelle, attracted most of the boys.” The band members still agree that there was very little dissension. The musical arrangements were contributed by all group members and no one tried to dominate the band. 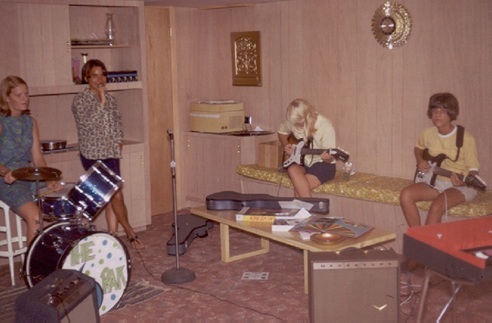 Initially, they began practicing in Cindy’s parent’s basement. Once they had acquired their own equipment and Paul Arbanas became involved, they moved their rehearsals to a small room located near Mary’s parents’ living room. Eventually, the equipment was stored and practice sessions were held at Danny Brown’s house. Evening practice sessions lasted until 9 or 10 P.M. The girls thoroughly enjoyed each other’s company on a social level, in addition to their musical camaraderie. They double dated, went to the beach and shopped together, as well as attending parties together. St. James School staged a talent show during April of 1967. Cindy’s father created a “6 Pak” sign for the band to display on stage. Their first few jobs were school and church related. By May, honor student and glee club member Marcia Boruta became the lead vocalist for the band. Mary and Andrea invited Marcia to join the band. They had all been friends since grade school. Marcia’s first job with the 6 Pak was at a Holy Spirit Church Auditorium dance. Local D.J. Bill Merchant was the M.C. for the event. The girls shared the stage with another local band called Reasons Why. This band included Pat O’Brien, Paul Gray, Vince Palazollo, and Denny Kaminski. 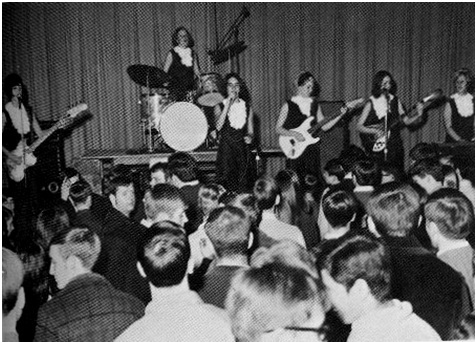 Rock groups were springing up everywhere in Grand Rapids during the middle and late 60s, including other bands from Grand Rapid’s west side, such as The Mafia and Joe Banana and the Bunch. Steve Mosketti helped Cindy learn how to play the drums and loaned her his drum set for the 6 Pak’s first jobs. Cindy: “Steve’s whole band helped us, but it was primarily Steve and Dan Purdom. We were eager to learn from anyone that would help us.” Mary recalls that Dan, the guitarist for Stix and Stones, was in her biology class. “Dan drew illustrations of chords on the neck of a guitar for me, just like Mel Bay chord books, and I’d take them home and learn them.” Another musician named Pat Kozak also helped Andrea with her keyboard technique. All of the girl’s parents were supportive of the band. Mary’s parents contributed generously. They loaned the band money for equipment and allowed them to use their new station wagon for hauling this equipment to their jobs. Mary’s older brother, Paul, served as manager. Danny Brown, a close friend of Paul’s, always traveled with the band, assisting with the driving and hauling of equipment. He drove Mr. Arbanas’ station wagon every weekend that they had a job. Karen and Cindy rode with Danny and the equipment while Mary, Rochelle, Marcia and Andrea rode with Paul in his Thunderbird. The 6 Pak fashioned their own outfits to wear at their performances. Most of these were jumpsuits made with various colors and patterns, including one created of purple velvet with white- laced collars. Marcia states that “one of our outfits was a shiny blue fabric, but there wasn’t enough blue material available for all six outfits, so my outfit was green. So I acquired the nickname ‘Peter Pan’ because of that outfit. We also had some publicity photos taken in my parents’ basement where we were wearing black and white checked outfits.” They made lighter outfits for the warm summer months. Band members often wore black ‘flats’ with their uniforms, which were in style at that time. The jobs that the 6 Pak secured during the summer of 1967 through manager Paul Arbanas and “word of mouth” were higher profile engagements that were coveted by other established bands. There was competition between the various bands for these quality gigs, and the 6 Pak occasionally encountered some jealousy. Many of these bookings were located at teenage nightclubs, which were extremely popular in the 1960s. These “clubs,” or more accurately, teenage dance venues, existed in many Michigan towns, both large and small. They began to appear more predominantly in the era of the early popularity of the Beatles and Rolling Stones, often referred to as the British music ‘invasion.’ There were a few teen nightspots in the Grand Rapids area that predated the peak period of these teen spots. The Eschelons worked at the Skyline in the Morton Hotel in 1959 as well as at Birdland Ballroom, in Ada, in 1960. Guitarist Mick Noonan also played at The Tones at 5110 West River Road, before it burned down, in the early 60s. 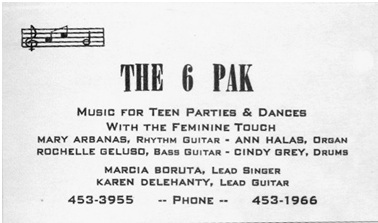 The 6 Pak worked at several popular teenage nightclubs around Michigan including the Platters, Johnny’s Bandstand, the Sweet Note, Club Ponytail, Shelby Pavilion, and the Teen Chalet. They also performed locally at the Phoenix Position, at 44th and Kalamazoo S.E., and the short-lived 25th Hour in downtown Grand Rapids. While they were at the Platters in Cadillac, the house disc jockey challenged the girls to learn the Rational’s version of a song that Aretha Franklin made famous, called “Respect.” He didn’t think they could do it. He gave them the recording and they learned their own version of the song. When they returned for a later engagement at the Platters, the DJ was totally impressed with the 6 Pak’s new rendition of this song and he finally displayed the respect that was due to them. In the 1960s, many American teenagers were questioning the values of their parents and the older generations, as well as political and military leadership. Seemingly inexplicable and fear-invoking events were occurring such as the Cuban Missile Crisis and the assassinations of President Kennedy, Robert Kennedy, and Martin Luther King. There was a growing suspicion among some young people that the American public was being misled. The questioning themes of some rock and roll lyrics, though often inane, addressed and reinforced this perplexed and untrusting mindset. A general relaxing or ‘loosening’ of social and religious values, which escalated in the 60s, also served to provide an increasing tolerance and acceptance for the “new music” which had originated only a decade before. Many parents eventually began to agree to allow their teenagers to assemble regularly in the teenage nightclub settings, even on school nights. Although there were teen rock and roll dances in the 1950s, they were usually restricted to weekends and were more tightly supervised. 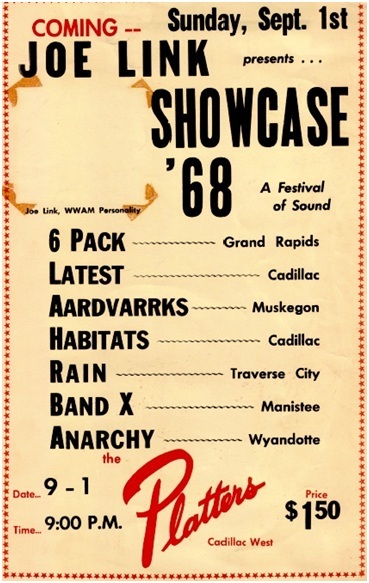 By the summer of 1967, local rock bands including the Headhunters (from Lowell), the Chevrons and the Fugitives (from Grand Rapids) and Black Watch (of Cedar Springs) had heard the 6 Pak at their practices or their engagements, or shared the same stages. A few of these musicians had become friends with the girls. Their paths were crossing throughout this summer. In August the Chevrons and the 6 Pak sat together during a talent contest in Lowell, which the 6 Pak won. The girls also worked at the 25th Hour with the Chevrons, during this same month. On August 18th they worked with the Headhunters in Freeport. They were on the same program with Black Watch at a dance in September as well as the Grand Haven Beach Bash during the following month. During September, Black Watch members showed up at a 6 Pak practice session and taught them “I Can’t Keep from Crying,” by the Blues Project. Cindy: “It was not as simple as the rest of our songs but we thought it was cool to play it.” They rehearsed with The Black Watch at Koscuisko Hall in the Sacred Heart Church neighborhood. That same month, they also worked with another Grand Rapids band called The Aardvarks. This engagement was at the Platters, which was located near Lake Mitchell, in Cadillac. They finished out the year by working with the Chevrons, again, at the 25th Hour, in December. 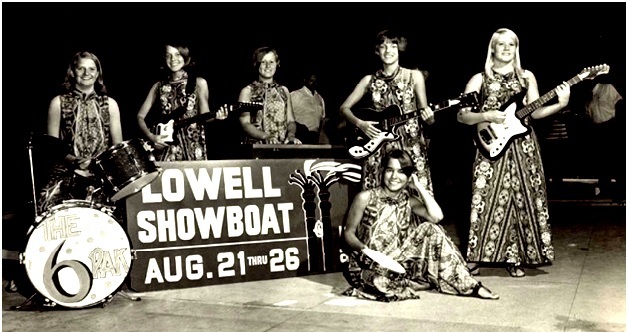 In July of 1967, the 6 Pak auditioned to perform for the annual Lowell Showboat celebration. The auditions were held at the downtown WZZM -TV studio. Legendary jazz pioneer Louis Armstrong was the headliner. He performed for a few nights, with the opening acts provided by local talent. On August 12th, the 6 Pak performed before Armstrong and his band. They met him and his group that same evening, which also included vocalist Jewel Brown, who sang with Armstrong from 1961-1968. Armstrong was very pleasant and signed autographs for all of the girls. They recorded twice at Midwestern Sound recording studio on West Leonard during this same summer. The studio was owned by Phil Roberts, who was also a guitarist for a prominent Grand Rapids band known as the Kingtones. The 6 Pak taped a few of the songs from their repertoire including Jimi Hendrix’s ‘ Fire,’ the Cream’s ‘I’m So Glad’ and Eric Burdon and the Animal’s ‘Sky Pilot.’ They worked on the instrumental parts first and then added the vocals while listening to the instrumental track through headphones. The girls also recorded a Jack Keller Ford radio advertisement at this same studio. This jingle was adapted to the music of Petula Clark’s “Downtown,” but it was never aired because of a copyright conflict. Mary Arbanas: “We didn’t have butterflies or get nervous before we went on stage. “ The 6 Pak recordings reveal that they were a well-rehearsed band. The vocal harmonies are concise and in pitch. All singers held their parts well, which is not easy to pull off, especially in a ‘live’ audience situation. Sound equipment was crude, by comparison, in the 1960s, and it was hard for the band to monitor the sounds which were created on stage. Their music appears to be more poised and less frenzied than those of many of their local male “garage band” counterparts. However, Marcia maintains that the 6 Pak never rehearsed in a garage. Phil Roberts was impressed with the The 6 Pak and invited them to play at an upcoming Boxtops concert at the Civic Auditorium on Sept 18, 1968. He financed and promoted this concert. 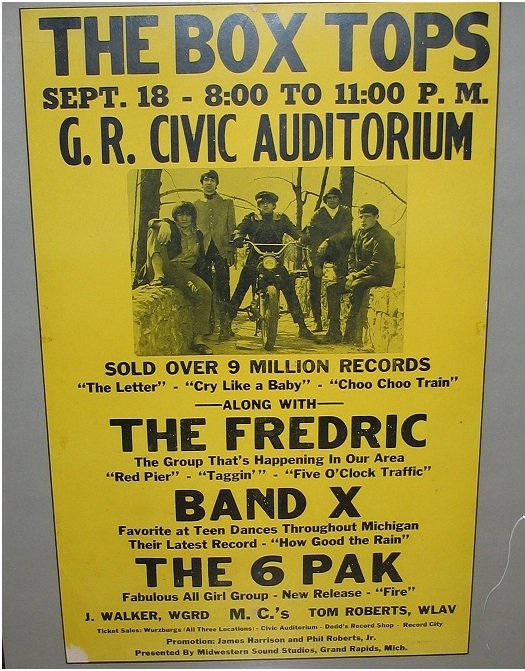 Also featured at this show were the Fredric and Band X, who had also recorded at Phil’s studio. The 6 Pak went out to Russo’s for dinner with the Boxtops after the concert. When the 6 Pak had jobs in town, it was typical for the band to go to a restaurant after they finished playing and use their pay to buy pizza. This is a page from the brochure for the September 18, 1968 Boxtops concert at the Civic Auditorium, which featured the 6 Pak as the opening act. Sadly, Phil lost his entire investment in this show when 5,433.80 in gate receipts were embezzled by Jim Harrison, according to a September 25, 1968 Grand Rapids Press article. Harrison was supposed to deposit the gate receipts in the bank, but instead, he fled town with his wife and his five year old daughter. Roberts never heard back from Harrison. From the fall of 1968 to the summer of 1969, the 6 Pak kept so busy with their band work that they missed many school functions such as sporting events and dances. But they did take a weekend off to attend their Homecoming football game and dance in the fall of 1968, partially because Rochelle was voted in as queen of this celebration. They all wanted to be there for her. During the last nine months that they were together, their jobs were primarily located at teenage nightclubs and college dances. In 1967, the band began working for the sum of 25.00 for the entire group, but they gradually worked their way up to a maximum of 200.00 per night in 1969, which was typical pay for a nightclub band in 1975. Unfortunately, wages for local musicians have not generally increased since the days of the 6 Pak. In early 1969, Paul and Danny proposed a plan to the girls which involved bringing the band to California in an attempt to promote their success. “But we knew we had to go to college and that was all there was to it.” Without many tears or other emotional fanfare, the 6 Pak disbanded as they all graduated from West Catholic in the spring of 1969. Their last performance was at Grand Valley State College, in late May. Marcia left Grand Rapids in the fall to attend college in Detroit. She served as a D.J. at a radio station while she was living there. She moved to California in 1974 and completed her undergraduate degree at the University of California in San Diego, where she still resides. Marcia sings with a group of women on Sunday mornings. Andrea attended Grand Rapids Junior College and Ferris State College. During her working career she has worked as a dental assistant, and in the retail clothing industry, with Michigan Consolidated Gas for 24 years, and Diocesan Publications for nine years. She has been very active in numerous local business and community leadership roles, as well. Andrea is retired and lives in Peoria, Arizona, and spends her summers in Michigan. Mary attended Grand Rapids Junior College and owns her own business. She has been self employed for over 30 years in the retail clothing industry. Cindy went to Chic University of Cosmetology and became a beautician. She has owned and operated her own hair salon for over 30 years. Rochelle went to nursing school and became an R.N. After graduating from college, she worked in Grand Rapids for a year and then moved to Kansas City, before returning to Grand Rapids to stay. Karen moved to Denver and lived there for awhile. She worked for years as a golf professional in Atlanta, Detroit and Greenville, South Carolina. The 6 Pak entered the local music scene in early 1967 without hype and pretense. They left it behind in June of 1969, retaining their humility and poise. As the girls worked at selling the band’s equipment and registered for their college classes, they were probably not focused on summarizing their considerable accomplishments, which were attained in less than two and one half years. But now, over forty years later, when they recall their achievements, it must seem like a sweet dream that actually came true. 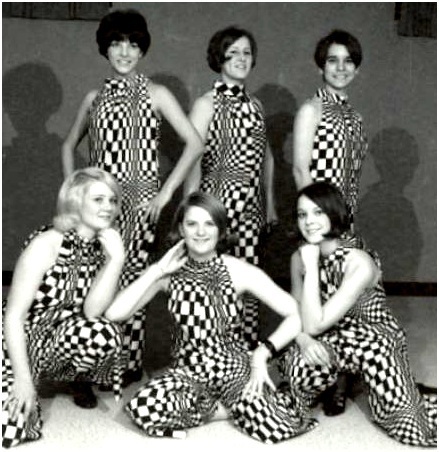 Footnote: There were several female singers performing and recording in Grand Rapids during the 1960s. Some of these talented ladies included Ruth Ann Lubinskas (Scott), Lin Nowicki, Patsy Stevens, Kathy Kahler, Diane Maxim, Cindy Marsh, Mary Rudolph, Sue Greiner, Ann Godfrey, Cheryl Woudstra, Cathy (Gail) Heeringa, Eileen Sarafis, and Trudy and Nancy Westbrook. Special thanks to Jerry Panek and Matt Weber for refurbishing the 6 Pak source recordings and providing photos and information for this story, as well sharing a deep appreciation for the 6 Pak. Thanks to Tom Kirby for his ideas and analysis concerning teenage nightclub history. Thanks to Phil Roberts for clarifying issues pertaining to the Boxtop’s concert which occurred at the Civic Auditorium in September of 1968. Please let me know 2017 appearances, locations and times. Where and when will you play in 2017? I am not on facebook so please tell me. I’ve heard good things about your group. What’s your schedule going to be for 2016? Please email a schedule of Grand Rapids appeaqrances..missed the Dirty Shame! Heard you were fantastic! Would like to know where Six-Pak playing. They are awsome! Here’s our schedule for the rest of the year. Wow!!! I never knew. Rochelle – I took lessons at Wendlandt’s for many years and practiced a few times with Joe Banana and the Bunch (wasn’t ready). I heard your radio bit on Monday (1340) and I AM IMPRESSED. Look forward to seeing and hearing more! The 6 Pak put on an excellent show in July with the Guiness Brothers at the Driftwood in Croton, MI. What is the schedule of your up coming events? Please email me a schedule of coming shows. I’d like to thank Kim for putting up with 6 women talking like crazy. It has been so much fun to re-live this time of our lives. You and your group make us feel like celebrities. Thanks for everything! Cindy did I hear your getting the band back together. If so – -enjoy every minute of it – what a blessing. Yes, we are going to play at the jam session on May 5. It’s hard after 45 years but we’re really having fun. Thanks.